The Ion Age Blog: Six Different 15mm Khanate Weapon Platforms, Gun Crew and Anti-Gravity lifter released! 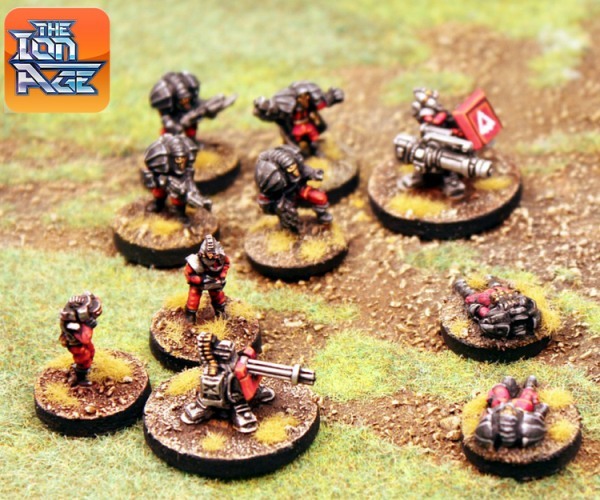 Six Different 15mm Khanate Weapon Platforms, Gun Crew and Anti-Gravity lifter released! The Ion Age makes all of its releases for the month of March today with a lot of new 15mm Shia Khan Empire codes all focused around portable weapon systems. 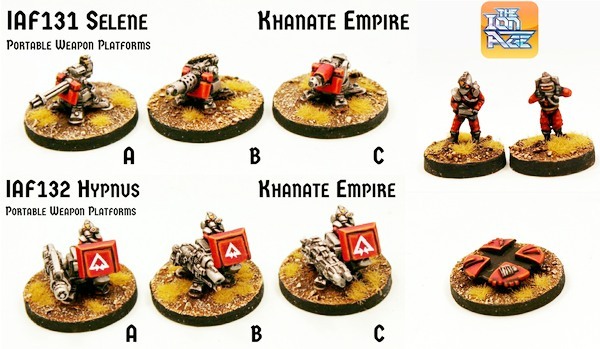 Check out the Shia Khan Empire on our website HERE or read on for more information about these new codes. All of these releases and next months too are working towards the release of the next Patrol Angis book which is scheduled for April 2017. Giving you a full infantry force for the client races of the alien Khanate. The first encounters with infantry support grade weapon platforms came with the initial break out from the Belkus Depression by those Shia Khan forces which had followed the digging machines. Though a watch was kept on the edges of the crater, which has once been the famed passages of the labyrinth, by planetary defence platoons they were rapidly overwhelmed by the aliens which poured out into the sunlight. The digging machines had no more than cleared their drive sections of the soft dirt and Legionaries as well as accursed Maligs followed them. Being some distance off due to the background radiation left over by the detonation of the fusion core the defence troopers had time to made transmissions back to Pelacan city to inform and then call for reinforcements. What was not expected from vids and audio from the gateway chamber was the immediate reach the enemy had. It was the first encounter with code name Selene and code name Hypnus portable weapon platforms. Floating forwards at a steady pace with two alien operators running alongside each of them the Selene platforms opened fire first upon elements of the 3rd Pelacan Regiment at a range beyond their ability to strike back. A barrage of 20mm cannon shells and laser beams were followed by the shrieking rage of 12.7mm rounds by the thousand and it killed many of the troopers who were unable to find thick enough cover. It was however once the aliens drew closer and the troopers loosed off anvil rounds and bursts of grenades from their Moth type 12's that the other Khanate platforms entered the fray. The Hypnus have a single operator who seems to be bonded to the weapon platform by a chair behind a thick gun shield. The weapons carried by the Hypnus are dangerous in their own right giving off in many cases a degree of radiation or gene potential damage. Atomic Destabilisers and Triple Plasma mounts tore through Aketon armour and the hulls of a half dozen Steornede Battlesuits at close range with ease. This led to the loss of the craters edge and marked the start of the remorseless advance of the aliens. Portable weapon platforms have proven tough to deal with without armoured support and the Khanate makes great use of them especially in urban areas to hold taken junctions and structures. The Selene is a portable weapon platform which acts as support for Khanate infantry. The pieces are the four legged stand and a chosen top mounted weapon. These parts make one complete platform. The options for the Selene are the Mars 20mm Chain Cannon (A), Maia 12.7mm Scatter Cannon (B) and the Juno 18kw Laser Cannon (C). These go with IAF133 Legion Gun Platform Crew. You can get an idea of the size of the finished portable weapon by noting that each of them is standing on a 30mm round base (their basing size for Patrol Angis) and again they are labelled with the letter corresponding to their variant weapon. Each pack contains ONE kit. You have the option of purchasing a pack or three packs with a saving. Price 2.00GBP per pack. Go HERE. The Hypnus is a slaved portable weapon platform which acts as support for Khanate infantry. The pieces are the four legged stand, legionary crew piece, gun shield and a chosen top mounted weapon. These parts make one complete platform. The options for the Hypnus are the Hydra 14Mw Laser Swarm Cannon (A), Helios 80kw Atomic Destabliser (B) and the Triple Jupiter Plasma 46mm Mount (C). You can get an idea of the size of the finished portable weapon by noting that each of them is standing on a 30mm round base (their basing size for Patrol Angis) and again they are labelled with the letter corresponding to their variant weapon. Each pack contains ONE kit. You have the option of purchasing a pack or three packs with a saving. Price 2.00GBP per pack. Go HERE. While it is perfectly fitting to have your Selene or Hypnos Portable Weapons static on the battlefield giving fire support or acting in a defensive and dug in formation you might want some pace to them and a way to get them around during the heat of battle. To that end we have a motive system suitable for them. For use by the Legionaries of the Khanate. 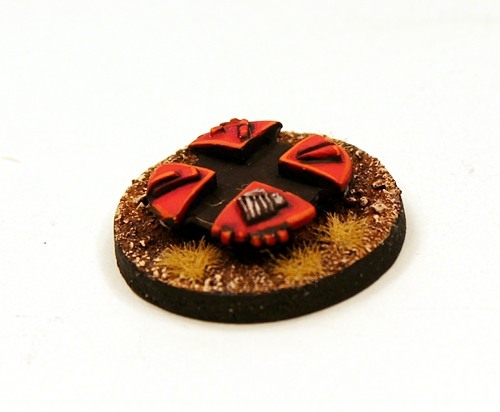 This pack contains four identical 15mm scale white metal miniatures. These fit with the IAF131 Selene and IAF132 Hypnus platforms. Price 4.00GBP per pack. Go HERE. 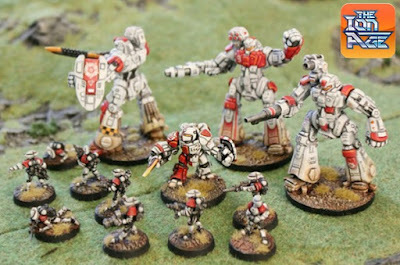 This pack contains two 15mm scale white metal miniatures in different poses. Two Legionaries in glimmer suits with the first holding the remote control interface for a portable weapon and the second with interface range finder. 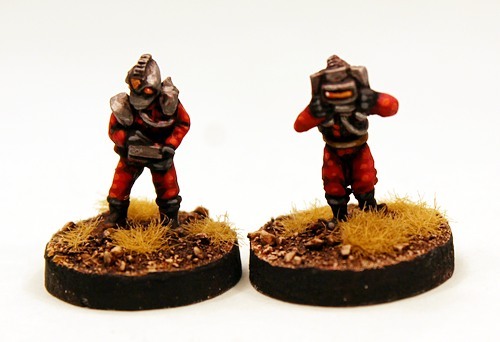 Combine these portable weapon crew miniatures with IAF131 Selene Portable Weapon Platforms or use them for other purposes in your forces. Choose from a pack, three packs with saving or single poses. Price 1.00GBP per pack. Go HERE. With all of our releases made for the month of March 2017 we want to remind you that you get IMP43 Female Muster Banner Bearer who fits right in with your Muster or Patrol or even Planetary Militia platoons in play free in every order. Until the end of February she is included at one per order (you can order more of her this month by going to the Year Collection page) and you get your Reward Points on your account too. We have two more things to show you later this month. An example page from the coming Khanate Return book the third in the Patrol Angis series and an article about an Afara Strider in the service of the League of Canlaster taken from our own gaming collection. The Afara is generic enough for many settings and it is designed for tabletop gaming being easy to assemble from few parts and durable to use in play too. I am also told it can be easily converted and altered with parts from our other codes such as IAF065 Vehicle Conversion Kit. Lastly we have a new month long special offer...it is a bloody good one....25% off all three variants of the IAF128 Afara Strider our resin light mecha which is 55mm tall. Click on the links. Love the new weapon platforms and this month's free unique miniature is one of the best yet. Can't wait for the Shia Khan supplement to come out ! Thanks Andrew. It will not be long...April is soon!